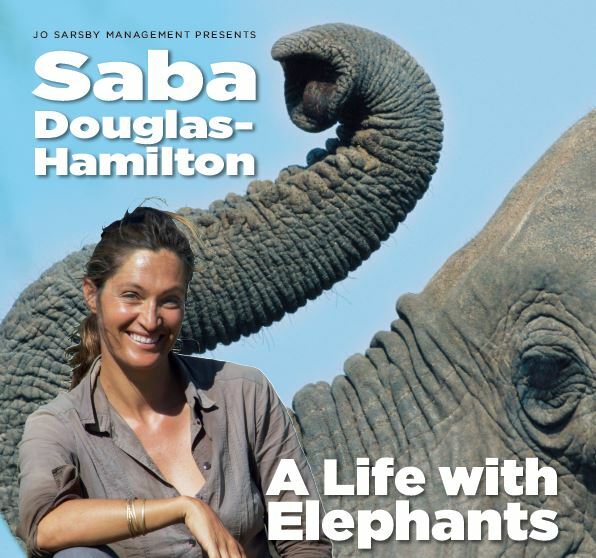 Saba Douglas-Hamilton rose to fame as an elephant conservationist and TV presenter on the BBC series This Wild Life and Big Cat Diaries. She is undertaking a UK tour criss-crossing England, offering theatre goers an evening of wildlife stories as well as a behind the scenes look at her family’s life in a remote safari camp. Saba grew up in the bush with her parents Ian and Oria Douglas-Hamilton, renowned conservationists in their own right, and was introduced to elephants as a babe in arms. She was sniffed from head to toe by an elephant called Virgo, whom her mother had come to trust, a ‘baptism’ she believes was part of her lifelong love of elephants. 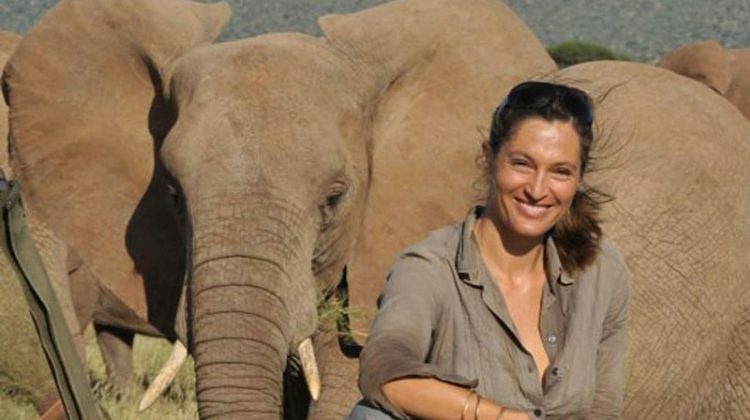 Together with her husband Frank, who works as Chief Operations Officer for Save The Elephants, she relocated her family to Elephant Watch Camp in the Samburu National Park, a luxury safari camp set up by her parents. This move and the dramas of running a safari camp with a young family in remote Kenya was the subject of the BBC series This Wild Life. How much are tickets? Around £20. Some venues have discounted tickets for theatre members and students, 60+, etc. How long is the performance? Two hours 20 minutes. Can I bring my family? Suitable for children aged over twelve. Can I get an autograph? Saba will be around after the talk for a meet and greet. Tour merchandise? 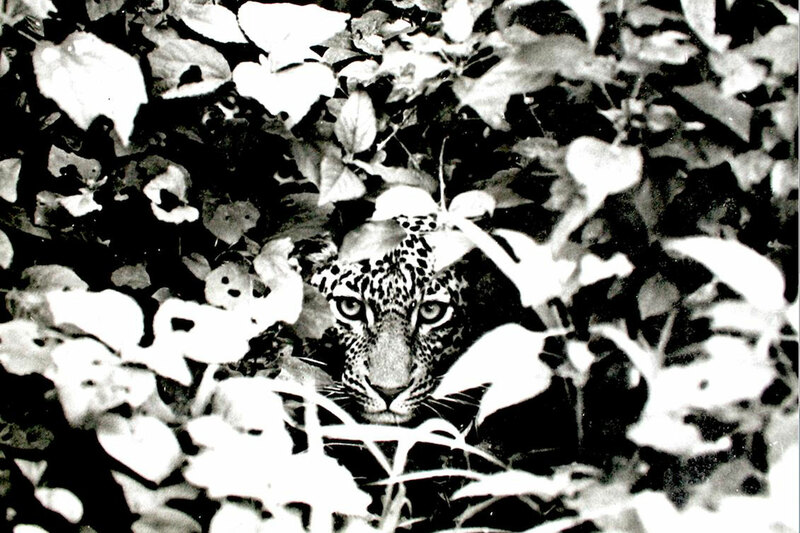 Saba has a selection of wildlife photo prints for sale – bring cash on the day to buy these. Got this far and not found the answer you want? Pop a comment in the section below and we’ll do our best to answer it. It may well help others too by allowing us to update this blog. Start your safari holiday planning now by giving us a call or popping us an email. 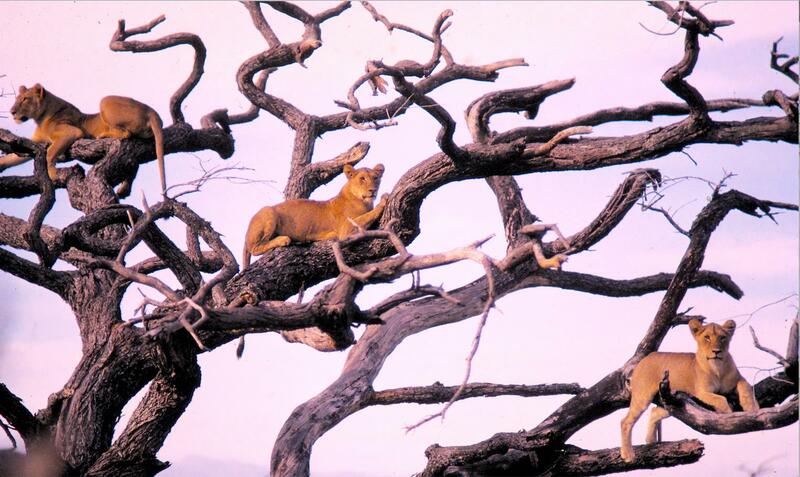 We’ve visited the Samburu National Park and know the other wildlife areas of Kenya intimately. 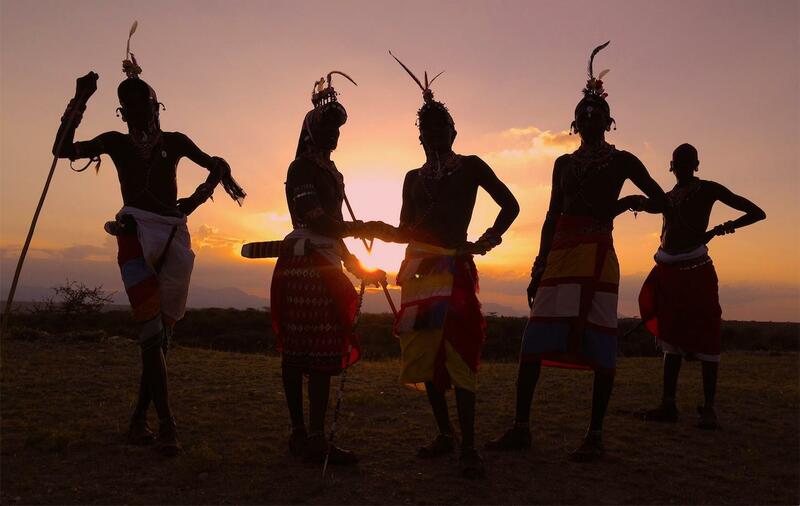 We can ask the right questions, suggest camps, lodges and safari areas, or match you with the right luxury safari for you. 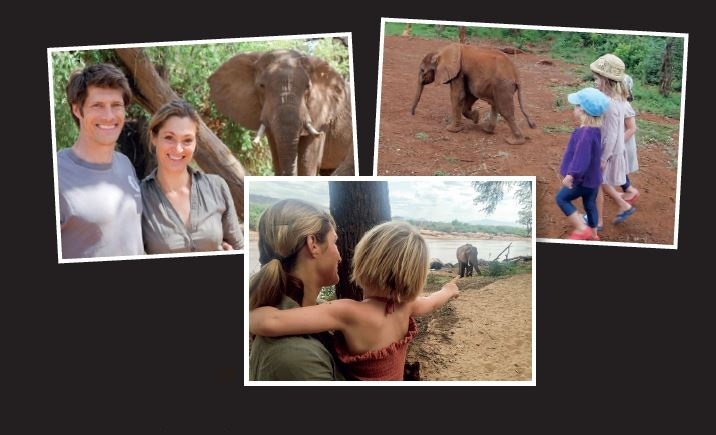 Read our Q&A interview with Saba on life in a safari camp in Kenya with your family. I had the honour of being Bill Woodley’s friend, stayed at Kamboya many times. Keep up your good work Saba. I had a totally magical holiday at Saba’s Elephant Watch Camp. I highly recommend it. I loved it so much I am planning to go back soon. Wonderful work done by the whole family and staff. Dear Mr Macgregor, Saba Douglas-Hamilton did visit four theatres in Scotland during her tour last year – Edinburgh, Oban, Stirling and Aberdeen. Sadly these were not among the best-attended shows. We enjoyed watching BBC’s ‘This Wild Life’ too. Your enquiry has been passed on to one of our safari experts. Can you send me details of staying at the Safari camp please ? Your query has been passed on to one of our safari experts. Hardly a UK tour – nothing north of Manchester and certainly nothing in Scotland! What a shame. I saw this advertised in Bristol when visiting my daughter earlier in the summer, but sadly there is nothing remotely close to where I live in the Scottish Borders. I am a great supporter of the David Sheldrick Elephant Orphanage in Nairobi and would have been very interested in attending…. Dear Christine, Saba Douglas-Hamilton did 5 venues in Scotland in 2015. I know that is little consolation this time, but we hope that a future tour will include the North East and Scotland again. Does this lady plan to visit Scotland with her lecture tour? Dear Jim, Saba Douglas-Hamilton did 5 venues in Scotland in 2015. I know that is little consolation this time, but we hope that a future tour will include Scotland again. When can we follow more of Saba and her family exploits???? My Granddaughter, Lilly and I watch every episode!!!!! Such a disappointment that Saba is going no further north than Manchester and completely misses Yorkshire. I hope this will be rectified on future tour dates. Dear Pat, I’m sure she will next time. I’m sorry that it doesn’t help this year, but she did speak in a number of theatres in Yorkshire and Scotland in 2015. Is there any way to contact Saba or a representative in private? We have booked tickets to come to see her in Manchester but won’t be able to stay for the whole duration because we are bringing our 16 month old who is named after her! We would love the opportunity to quickly see her before the show, would this be possible at all? Thank you for your request. I have emailed you privately. I grew up in Mwadui (Williamsons Diamond Mine) in the fifties and have followed all things African wildlife ever since. I will be attending your talk in Haywards Heath on the 4th Nov and look forward to your talk and meeting you. I would love to know more info / prices of the Elephant Watch Camp. 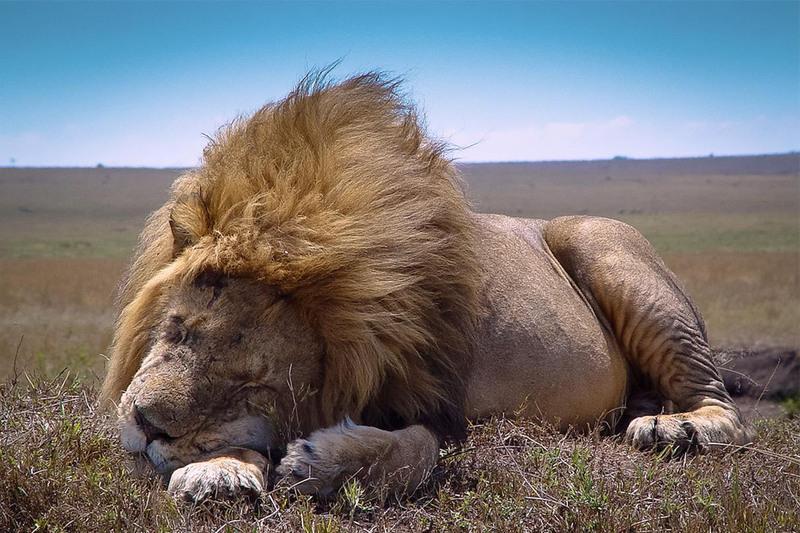 I would love to go on safari as its been my dream holiday for years and years ! I attended the Elephant Talk on 4th Nov, Saba was brilliant ! Glad you enjoyed the talk, your details have been passed on to one of our safari experts who will be in touch. Hi Saba, Thought the show last night in Swansea was brilliant! We have been fans of yours since you first came to our screens, our two kids grew up watching you. It was so nice to meet you after the show too, we love you even more after seeing you in person. Have you had any thought on the book you would take to your desert island? Wow. Saw Saba in Exeter this evening. Absolutely brilliant & humbling. We should all be doing more to save our wonderful wildlife. Thank you for a wonderful evening. And as for ‘Trump’ What goes around, (hopefully) Will come around. Believe in Karma. Any venues in Kent area? No venues in Essex. Perhaps next time? I know Saba tries to cover as much of the country she can, subject to sensible logistics and theatre availability.